September 26, 2017 by Ecommerce News. About Launch with tags Slovakia. 1513 views. 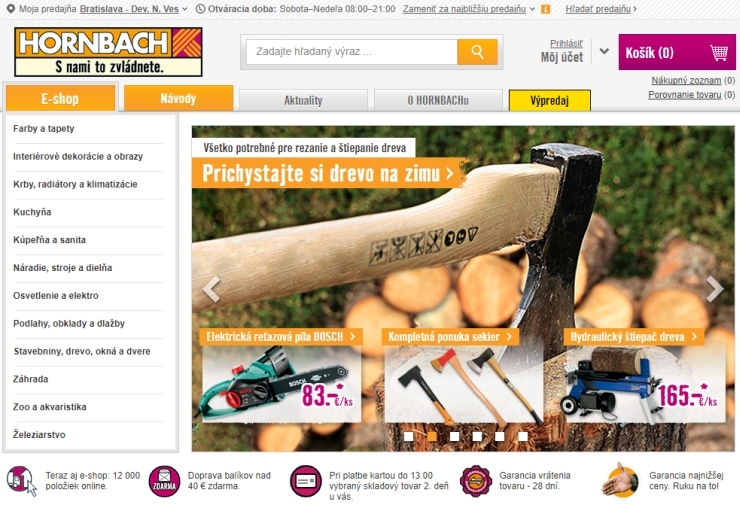 German DIY-store Hornbach has entered the ecommerce market in Slovakia. It launched an online store, which currently consists of 12,000 products that get sold at the same prices as in the physical stores. David Kolář, Chief Marketing Officer Hornbach for the Czech and Slovak Republics, said the do-it-yourself store chain decided to launch an online store in Slovakia, because its online stores in other regions have been a success and won the appreciation of customers. The online store is especially meant for consumers who don’t live near one of the three branches Hornbach has in Slovakia. It currently runs two physical stores in Bratislava and one in Košice. Hornbach.sk is not only a selling platform, it also offers professional instructions and techniques for home improvement. Currently, the online store offers 12,000 products, but the company said it will soon expand the offering. It also guarantees that products can be returned within 28 days instead of the standard 14 days online stores in Europe are obliged to offer.